Thales Alenia Space has signed a new contract with the Korea Aerospace Research Institute, KARI, to deliver the X-band communications system for the KOMPSAT-7 mission (Korea Multi-Purpose Satellite 7), with a target launch in 2021 and a satellite lifetime of five years. 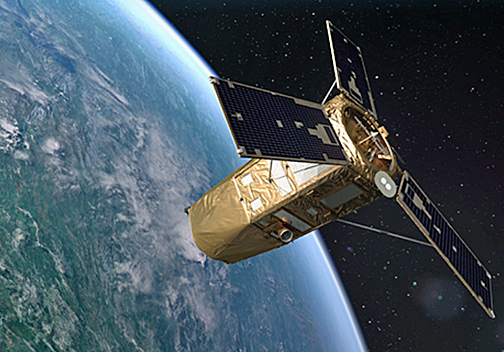 Artistic rendition of KARI's Kompsat-7 satellite. Image is courtesy of KARI. KOMPSAT-7 is an Earth Observation mission (EO) in Low Earth Orbit (LEO) developed by KARI to provide high resolution satellite images to satisfy South Korea’s national needs. It will orbit a high resolution optical instrument, AEISS-HR (Advanced Earth Imaging Sensor System — High Resolution) featuring 0.3 meter resolution. The X-band system will be in charge of transmitting the high resolution images to the ground station through a high speed data downlink. Eduardo Bellido, CEO of Thales Alenia Space in Spain, noted that the company's contribution to the KOMPSAT-7 Earth Observation program is the latest milestone in a long-standing fruitful collaboration with KARI, through multiple programs such as COMS-1, KOMPSAT-3A, GEO-KOMPSAT-2, KOMPSAT-6, CAS500 and KPLO.